The burial places of the bodies of those lost on the Sea Horse have caused great confusion for nearly 200 years. Three sites: Tramore Church yard, Drumcannon Church yard and the Rabbit Burrows were all claimed to hold burials of officers and men. The Drumcannon Church of Ireland Parish Register recorded by the Reverend John Cooke, relating to the wreck was destroyed in 1922. 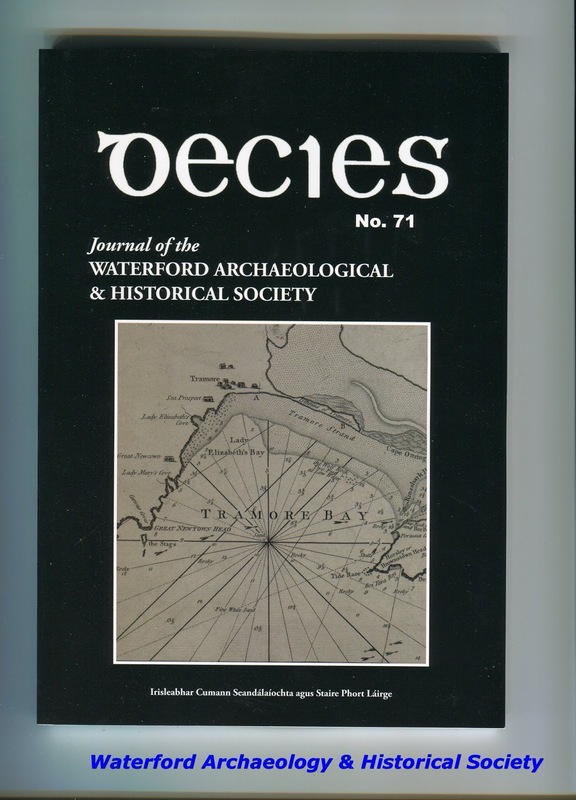 However, Cooke made a copy of the original, according to which, the burials commenced on 2 February, when thirty three persons, 11 men, 6 women and 16 children were buried at Drumcannon ruined church and graveyard on the outskirts of Tramore. 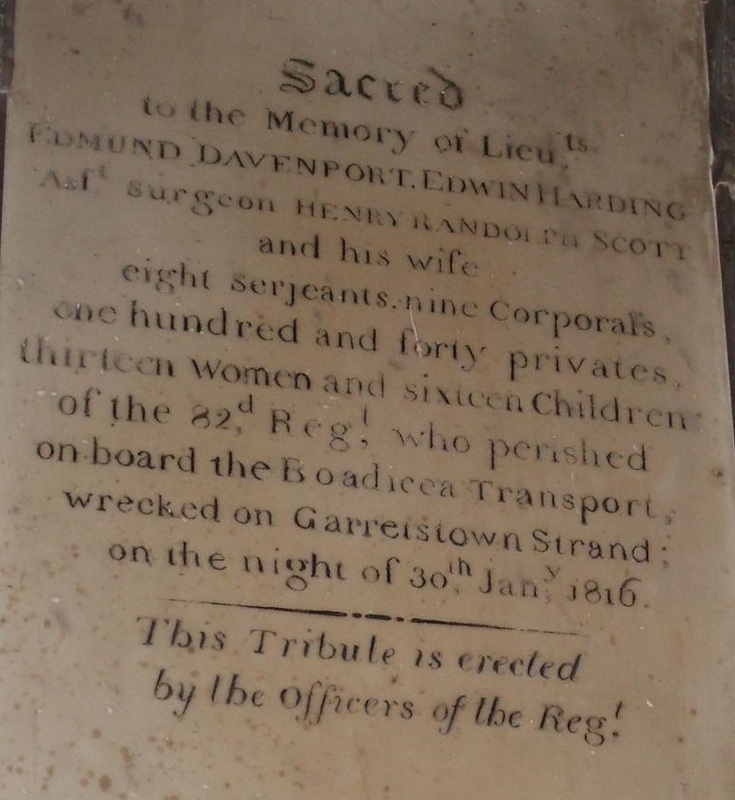 The first of the deceased officers to be buried was Lieutenant Dent whose body was cast on shore on 1 February: ‘This day one dead officer has been cast on shore; his name is Dent. Thirty two bodies were yesterday buried in one grave, men women and children. My pen recoils- my heart trembles as I write! Brave warriors! Companions of Wellington! And liberators of the world! Was this your hoped return?’ Dent’s funeral, which actually took place on 2 February, was reported to be mournfully striking, the officers and privates of a party of the 97th Regiment attended with arms reversed, and three volleys were fired over the grave. Mr Cooke, read the funeral service with feeling and dignity. The Rev Mr Wall, Catholic Assistant Clergyman, waited on the invalid officers and proffered, with great kindness and feeling, his and the Parish priest’s best offices. ‘All was a union of harmony and feeling for the sufferers. Several Ladies and Gentlemen gave assistance to the officers’. Cooke’s register records the burials of Lieutenant Dent of the 59th Regiment, 2 men, 1 woman and 1 boy on 3 February. There were no further burials recorded for over a week, until, on 12 February, Lieutenants Ross, Gillespie and Geddes were buried at Drumcannon. Lieutenant John Cowper reported that Geddes body had been washed up in a letter dated 7 February, a considerable time before the burial. The bodies were reported to be kept in a shed. Two days later, Mrs Baird, wife of the Quarter Master of the regiment and four men were buried. On the 18th, another man out of the ship was buried. On the 27th, two persons, surgeon Hagan and one private were buried. The burials at Drumcannon continued into the following month. On 3 March, one man and one child were buried. Over the next three days, a further five men were buried. On the 7th, Mrs Robinson and two privates were buried. The next day, Sergeant Major Watson and two privates were buried. On the 9th, one woman was buried. On the 10th, and the 11th, a further 4 men were buried. On the 12th, Lieutenant Veale and two privates were buried. There may have been some confusion as to the identity of the body as Captain McGregor’s name has been crossed out in the original entry and replaced by Veale. Another man was buried on the 13th and on the 15th four men were buried. On the 16th Captain McGregor, Lieutenant Scott, Ensign Hill, Lieutenant Allen of the Royal Navy, two privates and one woman were also buried at Drumcannon. On 17 March, they began to bury the bodies on the Rabbit Burrows, when thirteen men were buried there. The following day a further three men were buried there. Between the 29th and the 31st, a further five men and two women were buried there. In April a further four men were buried. On 4 May one man was buried. The final entry was William Baird, Quarter Master, buried on the 28 May. It has been asserted elsewhere that the burials began on the Burrow because Drumcannon graveyard was full. This is hardly the case as the graveyard remained in use into recent times. It is far more likely that the decomposition of the bodies had advanced to such a degree as to render their transport non-viable. Rev Cooke often preformed service over uncovered bodies, at the risk of life and health. In total 82 people from the wreck were recorded to be buried in Drumcannon, 10 officers, 43 men, 11 women and 18 children, with a further single officer, 26 men and 2 women buried on the burrow. In all Cooke recorded that he buried 18 Children, 13 women and 80 men, which if the official total of those lost was correct, leaves 25 children, 20 women and 213 men with their graves in the bay. What of Major Charles Douglas and Assistant Surgeon Lambe? Their names are included on the memorial stone as being buried in Drumcannon. However, Reverend Cooke while naming all the other officers that were buried omits to mention Douglas and Lambe. It is likely that their bodies were not washed ashore or if so, were found in an unrecognisable state. Sir- The profound horror and dismay I have felt at the account of the Tramore wreck have been deeply increased on hearing, that the greater number of the bodies found were thrown into a hole contiguous to the Rabbit Burrow. As their removal now is utterly impossible, permit me to suggest a plan to ameliorate the last mentioned melancholy circumstance- First, to have the ground regularly consecrated both by Protestant and Catholic Clergymen, and a certain space around this sad depository enclosed with a low wall, a gravelled walk, and the remainder of the ground to be raised in a large mound, rising to the centre, by means of earth, &c. drawn there, which will serve as cover, amply, the lamented bodies, which has not been sufficiently done- in the centre, a handsome obelisk erected, on the pedestal of which the woeful occurrence may be detailed- the entire ground tastefully planted with Laurel, which bears the sea air, with privet, abundance of which can be procured at the Burrow, and other plants. 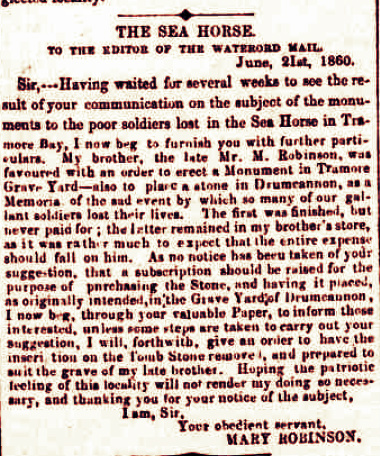 This plan, which can be put into execution at a moderate expense, either by subscription, assistance from government, or both, will render this now horrible spot interesting to Tramore, a pensive walk on a summer’s evening to view it, and also a convenient deposit for the subjects of any future misfortune- but above all it will prove a disposition to perpetuate the deep sense we feel of the disastrous circumstance. On the south side: Lugo, 6th & 7th of January, 1809 Corunna, 16th of January, 1809 Walcheren, August,1809 This monument was erected by Lieut, Colonel Austin, Lieut. Colonel Hoysted and the other surviving officers of the 2nd Battalion of His Majesty's 59th Regiment, as a testimonial of their profound sorrow for the loss of their gallant Brother officers who perished in the wreck of the Sea-Horse Transport in the Bay of Tramore on the 30th day of January 1816: and as a tribute to the heroic & social virtues which adorned their short but useful lives. On the east: Vittoria, 21st of June, 1813 St. Sebastian, 31st of August, 1813 Biddasoa, 7th October, 1813. On the 30th day of January, 1816 the Sea-Horse Transport. Capt. 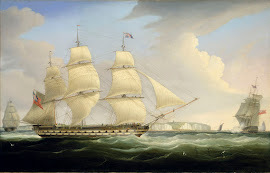 Gibbs, was wrecked in Tramore Bay; upon which melancholy occasion, 12 officers and 264 Non-Commissioned Officers & Privates of His Majesty's 2nd Battalion, 59th Regiment, together with Lieut. Allen, R. N., 15 sailors and 71 women and children perished within a mile of the shore. Of the hapless inmates of this ill-fated vessel, only 4 officers and 26 soldiers and seamen were providentially rescued from the raging ocean"
On the north: Nivelle, 10th of November, 1813. Nieve, 9th, 10th, 11th, 12th of December, 1813. 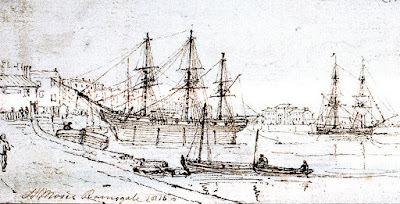 Bayonne, February & March, 1815. Sacred to the memory of Major Charles Douglas, Capt. James Macgregor, Lt. & Adj. Abraham Dent, Lieut. William Veall, Lieutenant Robert Scott, Lieutenant James Geddes, Lieutenant William Gillespie, Ensign Andrew Ross, Ensign Rowland F Hill, Surgeon James Hagan, Assistant Surgeon Lambe and Quarter-Master W. Baird of the 2nd Battalion 59th Regiment who were lost by the wreck of the Sea-Horse Transport. Your heroic deeds, Brave Warriors! Will never be erased from the page of history and though cypress instead of laurels encircle your temples, your cenotaph is erected in the bosoms of your countrymen. On the west: Waterloo, 18th June, 1815 Cameray, 24th of June, 1815 Surrender of Paris, 6th of July, 1815 The 2nd Battalion of the 59th Regiment commenced their Military Career in the Autumn of 1808 when they accompanied Sir David Baird to Corunna and were conspicuously brave in the arduous campaign under Lieut. General Sir John Moore. They partook of the Expedition to Walcheran. They also bore a distinguished part in the principal Actions that were fought on the Peninsula in 1813 & 1814 under the command of The Illustrious Wellington and finally participated in the renown of the ever-memorable day of Waterloo, and the second surrender of the French capital. Today I performed the melancholy duty of visiting the place where this disastrous shipwreck occurred. The bodies of the Officers which were found & many of those of the men, are interred in the churchyard of Drumcannon church, formerly the parish church of Tramore, but now in ruins, about a mile & a half distant from it. No funerals are yet in the new churchyard of Tramore - some of the bodies which did not come on shore until sometime after are buried in different places. Drumcannon church & a few farm cottages stand on a height about half a mile from the Bay. Mr. Cooke minister of Tramore performed the funeral service. A decent small farmer close to Drumcannon Church pointed out to me the spot where the officers are interred, viz on the left as entering the churchyard but no mark to point out by name the individuals, most of the men on the right hand as entering. My tears bedewed the monument at Tramore & the churchyard at Drumcannon, where repose the remains of a brother I most dearly loved. I passed a melancholy hour at each. Mr. Cooke Minister of Tramore read the funeral service on this dreadful occasion, attending every day for that purpose as the bodies were found. I should like to ascertain from him if he knows the exact spot where repose the remains of James in order to mark it by a stone with the name. I regret that I was not aware of the mausoleum being at Drumcannon until my visit that I might have directed it & seen it done. According to a later inscription, ‘the cenotaph was restored in October 1881 by General Hope Graham C B who as a Lieutenant Colonel commanded the 59th regiment for seven years’. Beneath this tomb are deposited the remains of Major Charles Douglas, age 29, Captain Jas McGregor, 21, Lieut and Adjutant Abram Dent, 26, Lieutenants William Veal, 21, Robt Scott, 21, James Geddes, 21, William Gillespie, 19, Ensigns, Andrew Rose, 19, Rowland F Hill, 19, Surgeon Jas Hagan, Assistant Surgeon Lambe, Quarter William Baird, of his Majesty’s Second Battalion, 59th Foot, who perished in the Bay of Tramore, 30th January , 1816, by the wreck of the Sea Horse Transport. 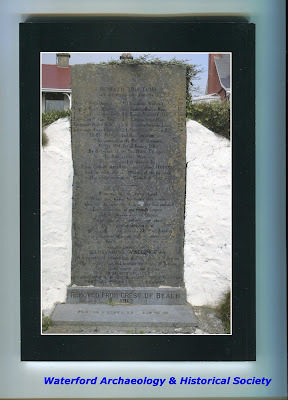 To their revered memories this testimonial is erected by Lieutenant Colonel Austin, Lieutenant Colonel Hoystead, and the other officers of the battalion, also the monument at the church at Tramore. Returning to their native land where they looked for solace and repose after all the toils and dangers they had endured for the security of the British Empire and the deliverance of Europe, their lives were cut short by the awful dispensation of an all-wise but merciful providence. But the memory of those gallant achievements in which they bore so distinguished a part under the guidance of the illustrious Wellington will never be forgotten, but shall continue to illuminate the historic page, and animate the heart of Britain to the most remote period of time. A testimonial, in memory of the brave fellows of the 59th Regiment, who perished in the Sea Horse, at Tramore Bay, on 30th January 1816, is to be erected midway between the life-Boat House and the Red House on the race course, exactly opposite where the vessel was wrecked. A public subscription has been already set on foot for the purpose, and the plan has been given by a gentleman in this city gratuitously. 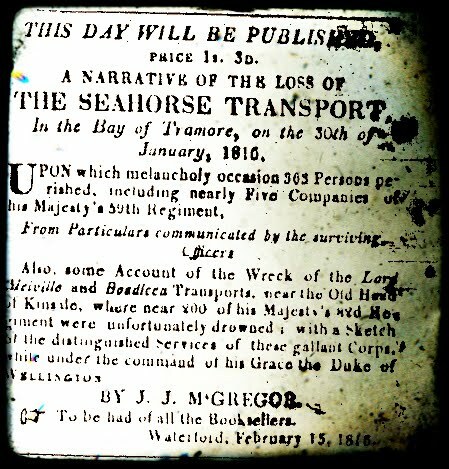 It is nearly forty-six years since the Seahorse transport, on her voyage from Portugal to England, after the Peninsular Wars, and with a large number of the regiment on board, was wrecked in the Bay of Tramore, and a very large number of lives were lost. Captain DeMontmorency, 59th Regiment, presents his compliments to Mr Jas. 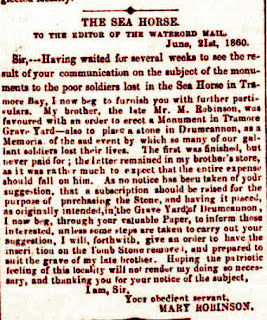 Butler Hughes, and in acknowledging the receipt of his note of the 10th June last-only received this day in consequence of detention at different addresses-begs to thank him on the part of his brother officers for the trouble he has taken about the tombstone commemorative of the loss of the officers and men of the regiment by the wreck of the Sea Horse in Tramore Bay, the purchase of which they accept with great pleasure, and the tombstone itself they have equal gratification in presenting through Mr Hughes to the local gentleman who have so handsomely offered to place it on a suitable monument on the beach at Tramore and on a spot as near as possible to the scene of the sad disaster. 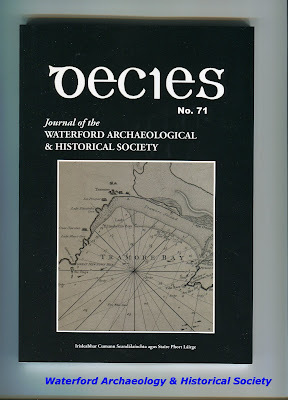 A post-office order on Waterford, payable to Mr Hughes, sent by Jos. DeMontmorency, is enclosed, with renewed thanks for his kindness. Subscriptions were set on foot, and the sums hereinafter stated were collected. Abraham Denny Esq., who has given us specimens of his architectural tact and skill in the Protestant Hall, and in the Tramore Schoolhouse, very generously furnished the design for the monument, made the contracts and superintended the completion of the work, and the monument which is very tasteful in its completion, is erected on the Strand at Tramore, as near the spot where the Sea Horse was lost as practicable. We regret to learn that it has cost more than the sum raised by subscriptions, and that the hon. Secretary, Mr Hughes and the hon. Architect, Mr Denny, are both out of pocket. The following are the subscribers to the fund, and we hope some other contributions will come in to recoup the advances of the secretary and architect. Wm. Johnson, Mayor; General Roberts (2nd subscription); J. S. Ambrose, John Sparrow; T. B. Prossor, Henry Sargent, Congreve Rogers, John Fanning, Joseph P Mackesy, George baker, Capt. Mansfield, Henry G. Prossor, Dr. John Mackesy, Abraham Denny, Edward Denny, Pierse Kelly, Joseph Coombe, Henry Davis, Edmund Power, J. Butler Hughes, 10s each; John Malcomson, John Jackson, John Phelan, Thomas Walsh, Henry Pope, Jacob Penrose, jun., T. R. Cherry, W. M. Alcock, William M. Reade, Joshua Strangman, Richard Mahony, Hancock Strangman, Henry Ridgway, jun., Henry Denny jun., Samuel Harris, George Morris, Pierce Ronayne, James Henry Hickey, Benjamin Moore, Capt. Glubb, James Delahunty, 5s each. In total £15, 15s was raised, enabling the placement of the monument on six small pillars near the three mass graves on the strand.’ An inscription was added, recording its restoration in 1862 by officers, non-commissioned officers and privates of the regiment. Despite his philanthropy, Butler Hughes’s business interests in Waterford failed and he was declared Bankrupt in 1865, having moved to England. Following a series of severe storms, the monument was removed from the strand in 1912 by Martin J Murphy and erected on the Doneraile Walk, high on the cliffs, overlooking the bay. 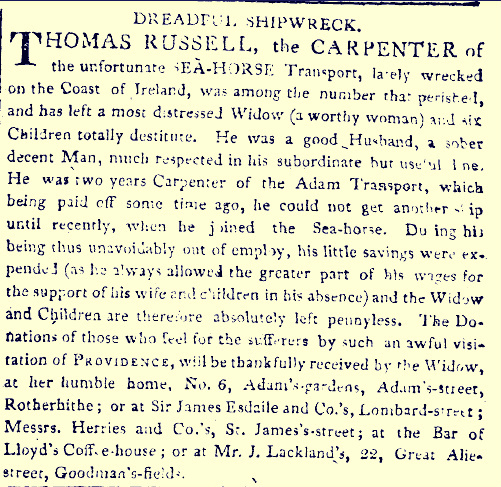 T Russell, the carpenter of the unfortunate Sea Horse transport, lately wrecked on the coast of Ireland, was among the number that perished, and has left a most distressed widow (a worthy women) and six children totally destitute. 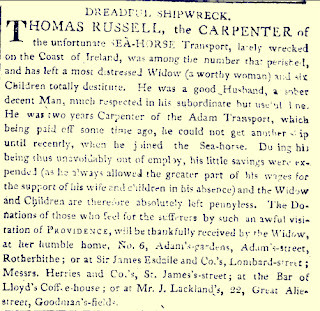 He was a good husband, a sober, decent man, much respected in his subordinate, but useful line; he was two years carpenter of the Adam transport, which being paid off some time ago, he could not get another ship until recently, when he joined the Sea Horse; during his being unavoidably out of employment, his little saving were expended (as he always allowed the greater part of his wages for the support of his wife and children in his absence), and the widow and children are therefore absolutely penniless.-The donations of those who feel for the suffers, by such an awful visitation of providence, will be thankfully received by the widow, at her humble home no 6 Adams-gardens, Rotherhithe; at Sir Jas Esdaile and Co.’s, Lombard Street; Messrs Merries and Co.’s St James street; Bar of Lloyd’s Coffee House and Mr J Lachlan, late Agent for the ship, 22, Great Alle Street, Goodman’s Fields. 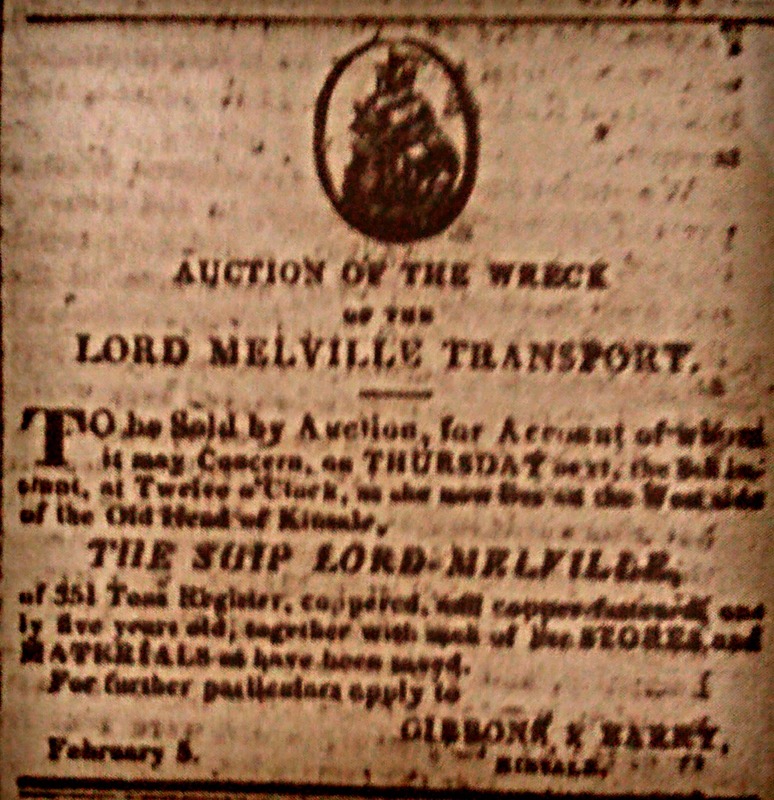 The Morning Chronicle, 24 February 1816. According to Captain Gibbs, the Sea Horse took on board at Ramsgate, on the 24 January, 16 Officers, 287 men, 33 women, and 38 children and a crew 17 in number. There was also a passenger, Lieutenant Allen of the Royal Navy, which including Gibbs himself, comes to a total of 393 souls. Total losses were reported to be 12 officers, 15 seamen, 71 women and children as well as the 264 enlisted men, a total of 363. While the numbers reported to be saved were 4 officers, 23 enlisted men, one of which died shortly afterwards and 3 seamen. However a letter from Ramsgate dated 6 February clearly related that, ‘the statement of men on board the Seahorse is not correct-there embarked here 14 officers, 266 men, 33 woman and 34 children.’ While there can be little doubt that there were 16 officers on board, the number of enlisted men, women and children remains open to question. Furthermore, an investigation into the Regimental Pay List from 25 January 1816 to 24 March 1816 confirm the deaths of 4 senior enlisted staff, 4 colour sergeants, 1 drum major, 10 sergeants, 14 corporals, 15 drummers and fifers and 197 privates on 30 January 1816, a total of 245 dead men, 2 of which died at the wreck of the Lord Melville. Adding the 22 enlisted men that are listed in the pay list as having survived the wreck of the Sea Horse, the total of the enlisted men recorded to be on board comes to 265. A figure much closer to the Ramsgate tally; if we take this reckoning as the more accurate of the two, then the numbers on board amount to 16 officers, 265 enlisted men, 33 woman and 34 children, 18 seamen and one passenger, a sum total of 367 souls of which 338 were lost. However, if the number of soldiers on board is incorrect in the official tally, then the number of women and children is also probably incorrect. Also, Gibbs stated that there were only 17 seamen on board, including himself. The exact figures of those on board and those lost is unknown. The Times, 8 February 1816. 59th Foot 2nd BN 1815 & 1816 War Office Regimental Pay Lists, 25 January 1816 to 24 March 1816 , WO/12/6870, The National Archives, accessed online at http://www.nationalarchives.gov.uk/. Tramore is looked upon as the best bathing place on the south east coast of Ireland. Its contiguity to Waterford gives it great advantages; but its invaluable superiority over every other bathing place I have seen, consists of its strand, which, when the tide is full out, leaves a space of between three and four miles in length of clear and compact sand, which may be travelled over by any vehicle. Tramore bay is of considerable extent, but exceedingly dangerous. To any vessel coming near it with a strong south-east wind it is fatal, of which the history of this little place furnishes a most melancholy instance. A few mornings since I took an early walk to explore a large amount of sand, the accumulation of ages, situate at the extremity of the beach. My attention was arrested by the frightful sight of a quantity of human bones strewn about me. These bleached emblems of mortality seen on a barren sand-bank, with the load roaring of the sea below, presented an appalling spectacle, and left the mind to a thousand conjectures of the cause which led to such a scene. Doubting whether to attribute it to deadly contest with Smugglers, who once carried on a considerable traffic in this bay, many of whom might have been shot, and unceremoniously thrown under the surface of the sand, or to a wreck, on my return home I made inquiry, and was asked if I had never heard of the Sea Horse Transport, which I confess I never had. My informant then gave me a detail of that awful calamity. The Sea Horse Transport was bound from Liverpool for Cork, and had on board a large portion of the 2nd battalion of the 59th regiment. On the 30th January, 1816, it was driven into the Bay Tramore by a storm, and within a mile of the shore was wrecked in the presence of hundreds of spectators, who from the violence of the storm were unable to render any assistance. By this dreadful visitation perished 12 officers, 264 privates and non-commissioned officers, 15 sailors and 71 women and children! Only four officers and 26 men were saved. Most of the bodies were cast on the beach, and carelessly buried on the sand bank to which I have alluded, a little above high water mark. The sea, it is said has since made some incursion beyond its usual limits, and exhumed the bones of these brave men. The surviving officers erected a monument in the church yard to their companions in arms, who perished in this melancholy catastrophe. This regiment was one of the most distinguished in the service. It was engaged in the memorable battles of Corunna with Sir John Moore, Vittoria, St. Sebastian, Bidassoa, Bayonne, Waterloo, Cambray, and at the second surrender of Paris. How painful to witness, and how discreditable to the Corporate Body of Waterford to allow, the bones of those to whom their country owed so much to remain so long neglected and disregarded!